The rainy season is underway in Southern California, home of the expansive MO Testing Center, and we have naturally turned our attention to seasonally appropriate riding gear. Today’s selection is a pair of Alpinestars Supertouring Gore-Tex Boots. These premium touring boots have all the features you’d want when you don’t know what kind of weather you’re going to encounter on an extended tour. The main upper is constructed of full-grain leather. Inside that tough critter’s tanned skin, a liner incorporates Gore-Tex throughout its construction. The top of the liner, around the rider’s calf, utilizes a breathable fabric that is quite comfortable against bare skin – for those times when your socks slide down after a long day. Similarly, all stitching around the boot top avoids the knots in the thread that can be irritating to the skin. 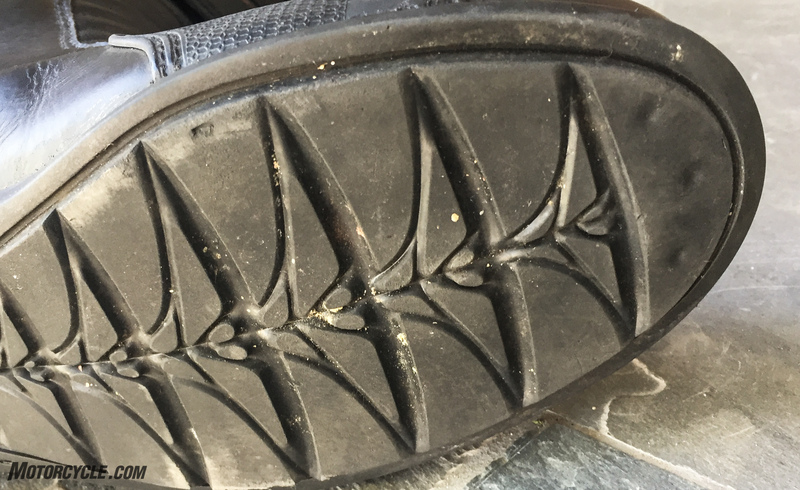 The tread pattern looks like it would be happy on a sport-touring tire, and it provides a firm connection to the ground even when the pavement is covered in water. The boot’s closure opens wide enough to easily to accept your foot. 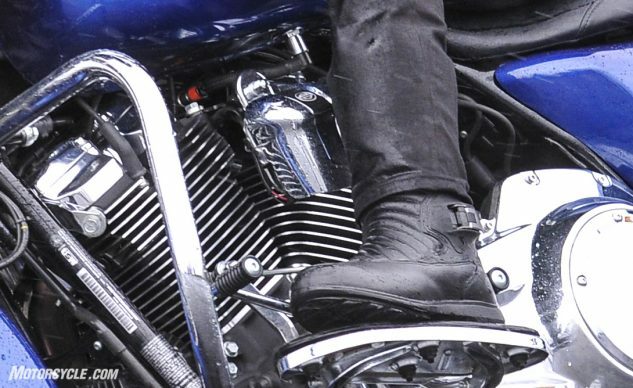 The armored front wraps fully around the rider’s shin from the outside-to-in next to the bike and attaches via a 4-inch wide, 5-inch tall swath of hook-and-loop fastener. Lower, around the angle a “lateral-side reverse-action pump ratchet” (say that three times quickly) cinches the lower portion of the boot snugly across the ankle. I liked how I could dial in a snug fit on my ankle but still have plenty of room to wiggle my toes to warm them up on colder rides. The ratcheting system is a bit fiddly the first time you try it, but after a couple days, I could do it with my eyes closed. The thermoplastic polyurethane (TPU) armor above protects the rider’s shins, while the accordion stitching allows easy flexing of the ankles. 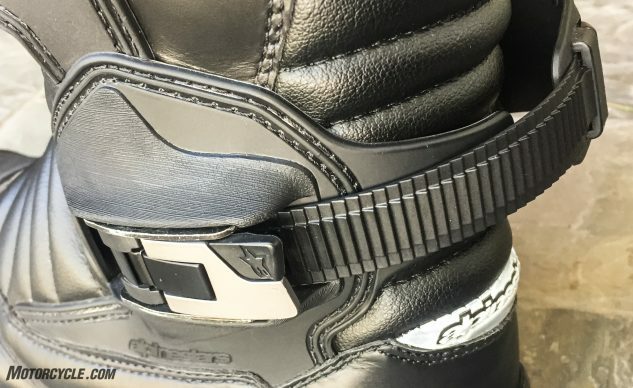 Ankle armor consists of a form-fitting cup on the medial malleolus (inner ankle bone) while the formidable buckle covers the lateral malleolus. You’d never know that there’s hard stuff there since the inner padding keeps your hard parts swaddled in comfort. 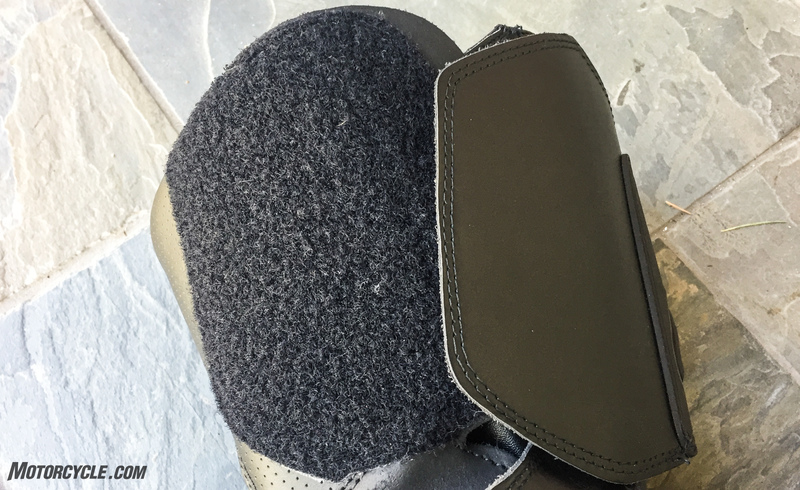 Heel and toe boxes provide protection front and rear. The reinforced shank offers arch support and protection in a tumble. The boot is CE certified for impact-absorption which points to how essential testing standards have become to gear development and marketing. The footbed is removable, making room for those who like to install special inserts. The ratcheting closure makes it easy to fine-tune the fit around your ankle. It’s also easy to release once you learn the trick. 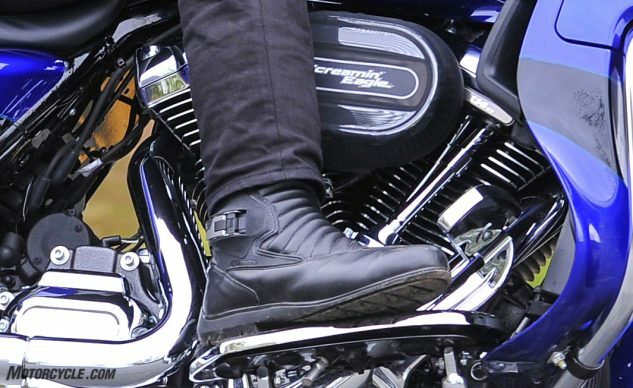 On my first ride with the Supertouring boots, I endured hours of torrential rain – some reaching almost biblical proportions – in the scenic Pacific Northwest at the Harley-Davidson touring line introduction (linked below). The boots kept my feet comfortable and dry. After only a couple days use, the boots felt broken in to the point that I could’ve owned them for a year. Still despite their easy comfort, the soles show almost no wear. Tire tread or boot sole? Who cares, as long as they grip the pavement, and they do. The ample hook-and-loop fastener allows a comfortable fit for a wide range of calf sizes. The Alpinestars Supertouring boots are available in Euro sizes 37–48. While my size 44 says US 9.5 on the interior label, the fit was more that of a size 10. 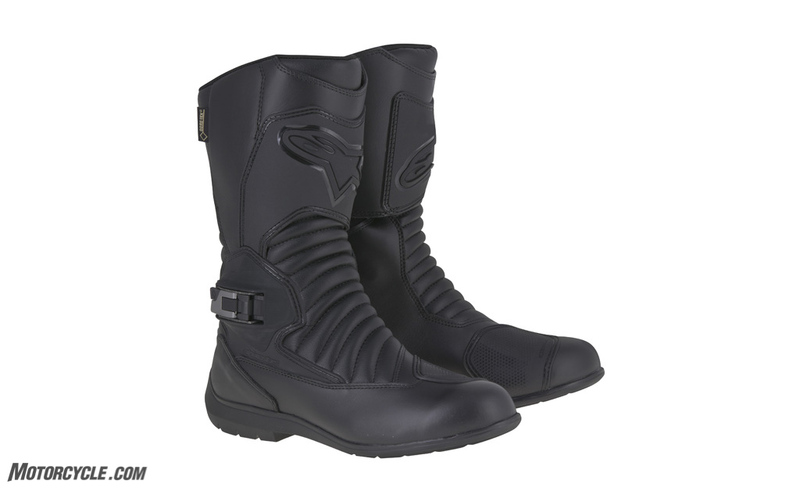 At $399.95, the Supertouring boots aren’t cheap, but their combination of comfort, protection and versatility will make them a valuable asset to any rider’s closet. You should get many seasons of use out of these boots. Learn more about them at Alpinestars.com. While trying to squeeze a photo session in between downpours, I learned that no amount of Gore-Tex will allow your feet to stay dry when the water is running down your leg on the inside of your jeans.